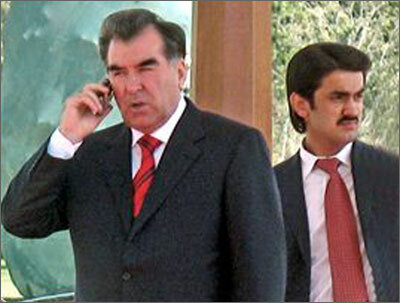 The President of Tajikistan is a lucky father: he has seven daughters and two sons. The eldest son of Emomali Rakhmnon – Rustami Emomali – is 22 and his father views him as the successor. Despite the fact that Rakhmon let nobody get close to him, apparently, his son is another story. Rustami Emomali participated in the negotiations, which took place in Dushanbe and was attended by the leaders of Afghanistan, Pakistan, Tajikistan and Russia, as Deputy Head of Youth Association of Tajikistan. It is interesting to note that up until now the deputy heads of public organizations were never allowed to the high level negotiations. "The appointment of Rustami Emomali to the position of Deputy Head of Youth Association of Tajikistan is not random – Dilbar Samadova, the Chairman of Social-democratic party of Tajikistan for Sogd Oblast, says. – The Youth Association has a right to nominate candidates to Madzhlisi Namoyandagon, supreme legislative power of the country". According to Abdukhakim Sharipov, the Director of cultural and social affairs in Sogd Oblast administration, the attraction of young politician in the political arena is natural. Rakhmatillo Zoyirov, the Head of Social-democratic party of Tajikistan, gave the following comment to Rustami Emomali in big politics "The election of 22-year old Rustami Emomali to the position of Deputy Head of Youth Association of Tajikistan – non-state body and public organization – is not standard: he did not prove himself in this organization. It is essential that he was promoted there as a son of the president". Rustami Emomali is 22. He attended higher education institutions in Tajikistan, Germany and Russia. He graduated from Tajik national university, majoring in International economic relations. Besides, he attended courses at Moscow State University of Foreign Affairs (MSUFA). However, the father took him back from Moscow: the son spent too much money in local casino. Moreover, Rustami Emomali is a sportsman. Today, he is the best scorer of Istiklol (Independence) Tajik football team. Since his first day in the field he became the best scorer: nobody wants to play against him. In addition to social activities, sports and studies, Rustami finds time for state service. He is the member of State committee for investment and state property of Tajikistan. In June of 2009 Rustami married the daughter of the owner of one of the biggest light industry enterprises in the republic. The question whether Rustami Emomali can take over the chair of Emomali Rakhmon is still rhetoric. There are also other opinions, indicating the fact that the entrance to big politics for Rustami is still closed. Mr. Zoyirov says that, first of all, Rustami needs to build his "team" because the team of his father would not be a help to him. One can bring up famous story of May of 2008 when journalists reported that Rustami shot his uncle Khasan Sadullaev, one of the most influential people in the republic. Sadullaev owns over two hundred companies in Tajikistan, including biggest in Central Asia aluminum plant.